GCU is creating a fund in partnership with the Grand Canyon University Scholarship Foundation that will provide 800 full-tuition GCU scholarships, 200 per year starting in fall 2016, to qualified high school seniors. To say Genesis Lopez is an inspiration is like saying she’s a college student who someday will have a job: a total understatement. Rather, the Grand Canyon University freshman, who is studying finance and economics in the Colangelo College of Business, is an illuminating example of how young people can soar when given the right learning tools and opportunities. Lopez is the face of Students Inspiring Students: A Neighborhood Scholarship. The new program is a pay-it-forward push to expand the Learning Lounge, GCU’s thriving after-school tutoring program, to inner city high schools throughout west Phoenix. To that end, GCU is creating a fund in partnership with the Grand Canyon University Scholarship Foundation that will provide 800 full-tuition GCU scholarships, 200 per year starting in fall 2016, to qualified high school seniors. The objective is to raise $1 million this year – $500,000 from donors to be matched by the University – and on Thursday, Mueller kicked the program’s momentum into high gear by announcing a personal contribution of $100,000. He is that convinced it will succeed. Donors responded to Mueller’s enthusiasm by pledging $350,000 to the Scholarship Foundation, which was matched by $350,000 from GCU and put the program over halfway toward its goal of $1 million. The Foundation contributions are tax-deductible, and 100 percent of all donations go directly to scholarships. 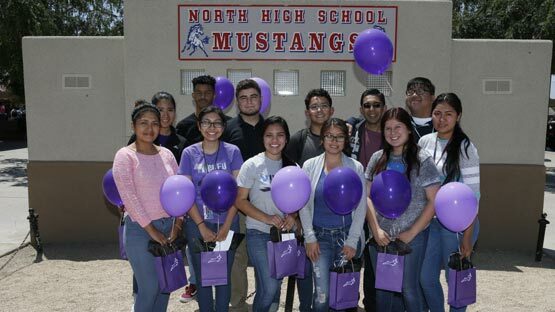 Since opening in September 2013, the Learning Lounge has helped more than 1,700 students at GCU’s neighborhood school, Alhambra High, at Bourgade Catholic High south of campus, and at Joy Christian High in Glendale, as well as K-8 students in the Alhambra Elementary School District. Initially, many students were shy and uncertain of their abilities, but their confidence soon blossomed and they wanted to stick around long after their homework was finished, said Dr. Joe Veres, director of K-12 outreach programs at GCU. The reason? GCU’s student tutors, Veres said. “Our students have strong academics, they are motivated and passionate to serve, and they have a heart for the Lord,” Veres said. Lopez, 18, does. The daughter of parents who never completed elementary school, she wanted to be the first in her family to go to college but figured she would start in community college and transfer to a university. As a junior at Alhambra, where more than 90 percent of students are from families that fall below the federal poverty line, she heard about the Learning Lounge and dropped by campus. She needed a little extra help in advanced placement courses and eventually graduated with a 4.1 GPA and a scholarship from GCU. Today, Lopez is a tutor in the Learning Lounge, helping other students reach their academic goals as she – and many other Alhambra students like her – had done. She’s building relationships and encouraging high school students to do their best. That is the core of the Students Inspiring Students scholarship program. Students who receive the full-tuition scholarships give back by providing 50 hours of academic and mentoring support annually in the Learning Lounge, paying it forward to others. Another Alhambra graduate and Learning Lounge tutor, May Carreon, earned a GCU scholarship after getting help on her scholarship essay from Learning Lounge tutors last spring. Carreon said she felt badly that other deserving students in her school and school district didn’t earn her scholarship. “This (Students Inspiring Students) will help many more students reach a level that I never thought I would reach,” she said. The first scholarships are scheduled to be awarded in May to seniors meeting the eligibility requirements, which include a 3.3 GPA, demonstrated financial need, spending 50 hours in the Learning Lounge while in high school, and a letter of recommendation from a current GCU tutor. The new initiative follows several significant neighborhood improvements that GCU has been focused on for the past seven years. These include a $1 billion, 10-year investment in the main campus, a $2.5 million capital fund to support local businesses and student entrepreneurs, a $1 million Phoenix police crime-suppression initiative and a $700,000 first-phase deal with Habitat for Humanity of Central Arizona to repair homes. When all is said and done, the neighborhood will be a place that people are clamoring to live, work, study and play in, Mueller said. “The kids in this neighborhood deserve the same opportunities as the kids east of Central Avenue,” he said. “All we need to do is extend our hand a little bit.” Under Principal Claudio Coria‘s leadership, Alhambra students are making incredible progress. Better grade from the state: When the Learning Lounge opened less than 2½ years ago, Alhambra was rated a D school by the state of Arizona. It is now nine points away from a B rating. Graduation boost: Alhambra graduated 536 students in 2014-15 compared to 417 in 2013-14. College scholarships: Alhambra seniors amassed $2.7 million in scholarships in 2014-15 compared to $1.2 million in 2013-14. Ryan Watson, Bourgade’s assistant principal for curriculum and instruction, described the Learning Lounge as a trailblazer, an opportunity and a blessing.